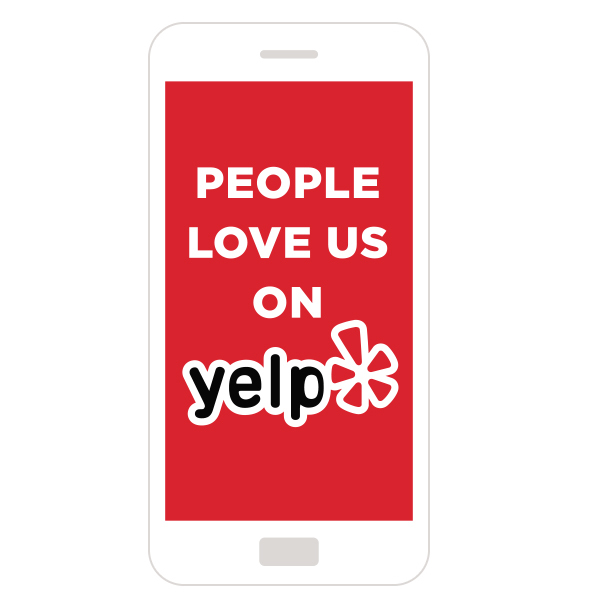 Thanks to our customers, we’ve experienced tremendous growth over the past few years, so much growth, in fact, that our current kitchen can’t handle the capacity we need. Translation: We are taking a break until we find a bigger, better commercial kitchen. 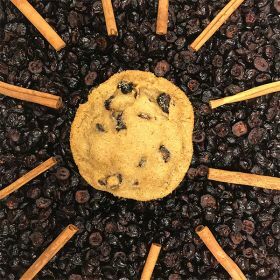 December 18th will be the last day for delivery of our cookies for a while. After then, we’ll accommodate special orders, so keep us in mind for parties and other special events. During the next two weeks, we expect orders to be very busy, so please be patient with any delivery delays that you may experience. Another request: If you hear of a commercial kitchen becoming available in SE, please email us! Made from scratch. Baked to order. Delivered from our ovens to your door. 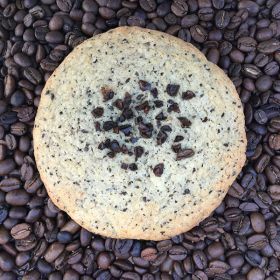 These delicious cookies are made with a modified sugar cookie recipe that combines coffee two ways: first, ground coffee is added to the dough of the cookie; second, whole beans are crushed by hand and used on top of the cookie to give it an added crunchy texture. 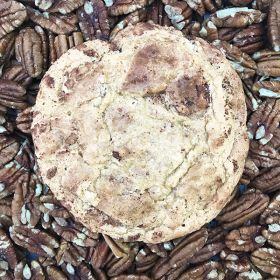 This delicious vegan, gluten free cookie features maple syrup, brown sugar, and pecans. *We make all of our cookies in the same kitchen and, even as clean as we keep everything, there may be trace glutens present. 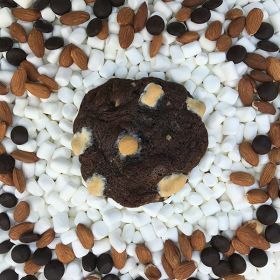 Reminiscent of rocky road ice cream, this double chocolate cookie has marshmallows and almonds mixed in and is topped with a smattering of toasty toasted marshmallows. 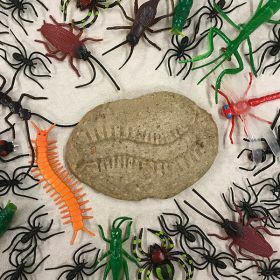 This Halloween cookies features walnuts, sugar... and cricket flour. Yes, that's right. Flour made from Crickets. You should steer clear of this cookie if you are allergic to nuts, gluten or... crustaceans. Yes, that's right. Crickets are in the crustacean family. 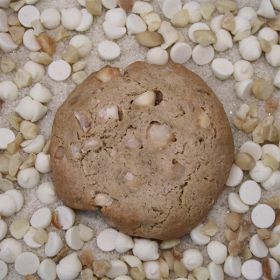 Roasted macadamia nuts and white chocolate chips make this gluten-free and vegan cookie seriously delicious. *We make all of our cookies in the same kitchen and, even as clean as we keep everything, there may be trace glutens present. 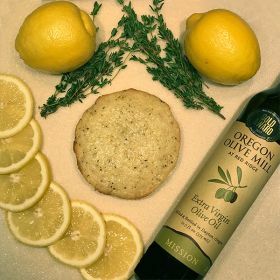 This bright cookie is made with Oregon Olive Mill's Mission olive oil, fresh lemons, and fresh thyme creating a must-savor treat! 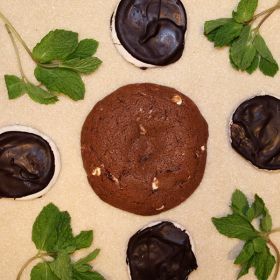 A double-chocolate cookie filled with crumbles of delicious Dark Chocolate Seely Mint Patties! 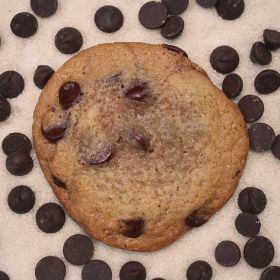 Featuring dark chocolate chips, our chocolate chip cookie is our most popular cookie. We use Liefie's Vegan Salted Caramel Sauce making it sweet, salty, and buttery (despite having NO dairy). 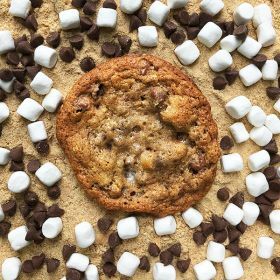 Reminiscent of the campfire treat, this cookie is made with graham crackers, milk chocolate chips, and marshmallows. 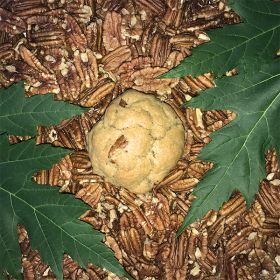 A pecan cookie rolled in Abuelita cocoa and cayenne pepper! 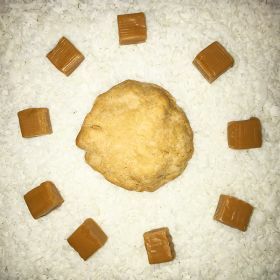 An orange spice pu'erh tea cookie that melds the complex flavors of Plum Deluxe's wonderful tea into an airy sugar cookie. 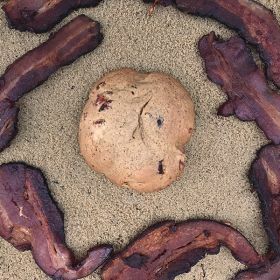 For this delicious cookie, we take OP’s subtly cured, sweet-and-savory bacon and begin by hand carving a slab of it, then cook it and baste the bacon with maple syrup. Then, we lovingly wrap the aforementioned confection into maple, brown-sugar cookie dough! 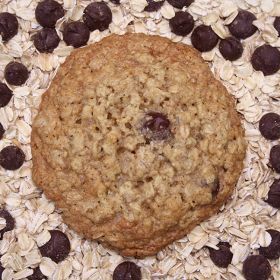 We partnered with Bob's Red Mill to make this delectable oatmeal cookie. 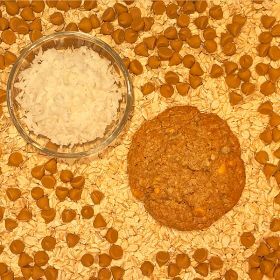 Using Bob's Old Fashioned Rolled Oats, this cookie also has shredded coconut and butterscotch chips. 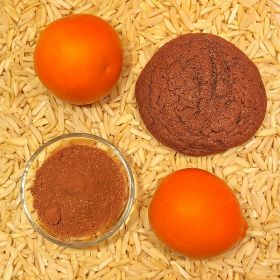 Made with Momo Cocoa's Queen Cocoa, this chocolatey cookie is bursting with almond and orange. 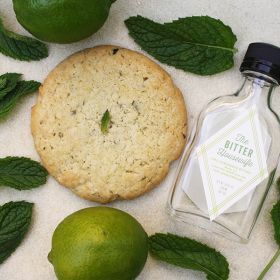 This sugar cookie is combined with the amazing Lime Coriander bitters from The Bitter Housewife and fresh lime and mint. The cookie is then topped with a leaf of fresh mint. A play on the classic ice cream drink -- the malted -- this chocolate cookie is made with malted milk, cocoa powder, and milk chocolate chips. 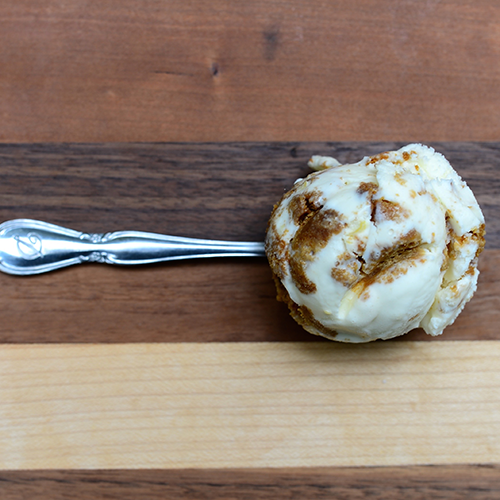 We teamed up with Bella Organic Farm to bring you the Bella Pumpkin Bourbon cookie. 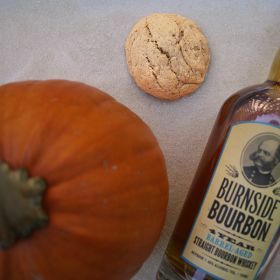 This pumpkin cookie takes nutmeg, ginger, cinnamon, and a splash of Burnside Bourbon to deliver a sweet, delectable taste in every bite. This cookie is a play on the classic childhood fav, peanut butter and jelly. 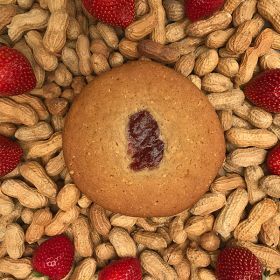 Using Bliss Nut Butter's peanut butter, this scrumptious peanut butter cookie has a healthy dollop of organic strawberry jelly. 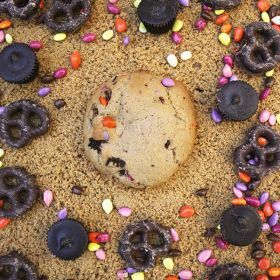 We combined chocolate covered sunflower seeds, dark chocolate peanut butter cups, and dark chocolate pretzels from Trader Joe's to come up with this crazy-fun colorful and delicious cookie! 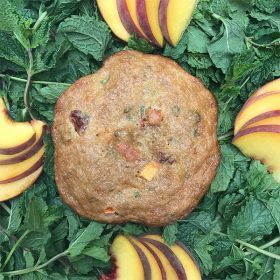 This delectable cookie is made with local Oregon Growers NW Peach Jam, dried peaches, and fresh mint. A portion of the proceeds with be donated to the ACLU of Oregon. 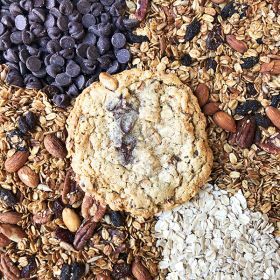 This sweet and salty cookie is made with Tracy's Small-Batch Granola, oats, and chocolate chips. 100% of the profits from Tracy’s Small~Batch Granola go directly to fund the work of their non-profit partner, Urban Gleaners. 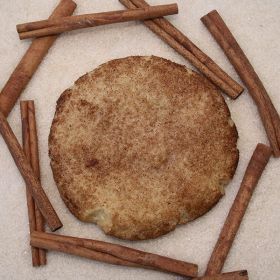 Made with Red Ape Cinnamon and 100% organic sugar, this snickerdoodle will leave you wanting more. This particularly unique cookie captures the experience of Vietnamese Pho. 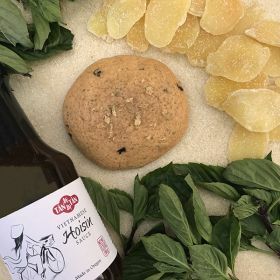 The cookie features Tan Tan's marvelous Hoisin sauce, fresh Thai basil, and cinnamon, and is topped with candied ginger. Possibly our strangest cookie yet! 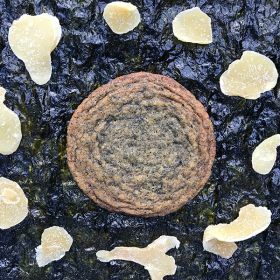 This sweet treat is filled with seaweed and candied ginger! 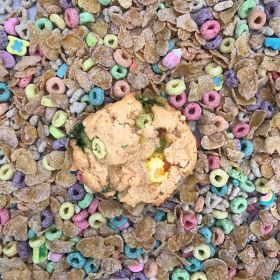 Nostalgia in cookie form, this delectable cookie is imbued with the spirit of Saturday morning cartoons watching Disney characters, Ninja Turtles, and Bugs Bunny's hijinks and filled with the tastes of Frosted Flakes, Fruit Loops, and Lucky Charms. 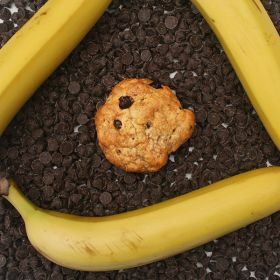 A gluten-free banana and chocolate chip cookie that's sure to make any monkey happy! *We make all of our cookies in the same kitchen and, even as clean as we keep everything, there may be trace glutens present. The Happy Monkey takes longer to bake so please allow extra time. 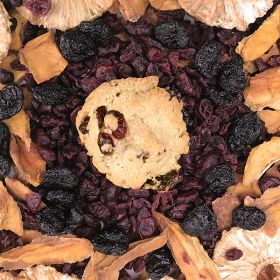 This vegan, gluten free cookie features dried pineapple, cherries, mangoes, and cranberries. *We make all of our cookies in the same kitchen and, even as clean as we keep everything, there may be trace glutens present. 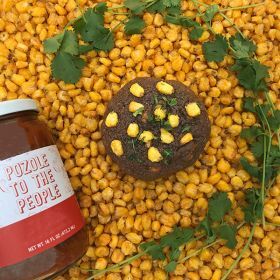 We teamed up with Pozole to the People to bring you the Pozole to the Cookie: dark chocolate, toasted corn from Albina City Nuts, a puree of organic dried guajillo chiles, Mexican oregano, fresh cilantro, and ground cumin. 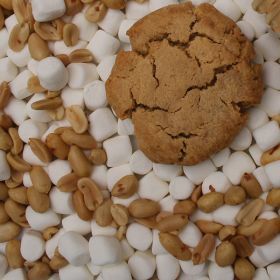 A delicious cookie made with peanut butter fluffed up with marshmallow! 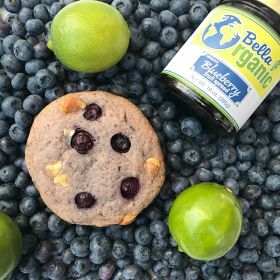 We once again teamed up with Bella Organic Farm to create this wonderful summer seasonal cookie. The Bella Blue includes blueberry fruit spread, lime juice, fresh blueberries and white chocolate chips. This delicious gluten free cookie is a chocolate-lover's dream. 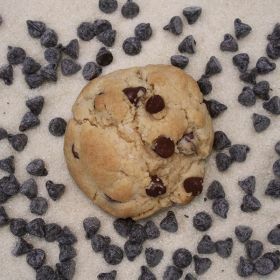 The dark chocolate cookie batter is bombarded with caramel and chocolate chips and then dusted with salt before baking. *We make all of our cookies in the same kitchen and, even as clean as we keep everything, there may be trace glutens present. 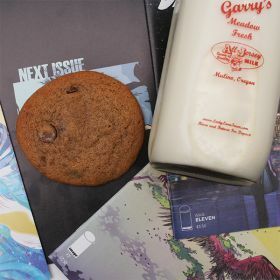 When the folks at Milkfed Criminal Masterminds reached out to us to create a cookie, they wanted their featured cookie to be milk fed. 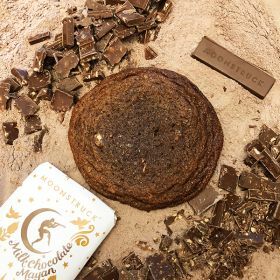 Bryce created a cookie that uses farm-fresh, local, whole milk and premium cocoa powder to create a fluffy cloud of a cookie that's too good to have just three. 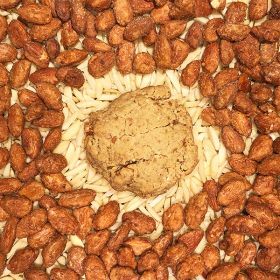 Ah-Nuts is made with delicious Secret Recipe Almonds from Ah-Nuts and organic maple syrup. This nutty cookie is gluten free and vegan! 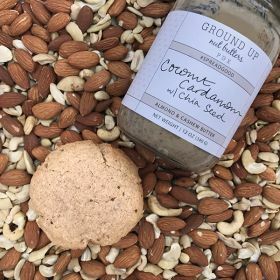 The folks at Ground Up Nut Butters put Almonds, Cashews, Coconut, Chia Seeds, Honey, Cardamom, Vanilla and Sea Salt into their delicious nut butter—and then we combine it with some absolutely killer cookie dough to make a confection that tastes good and does good! Oatmeal + Raisins + Craisins make this delicious delight. A seasonal favorite! 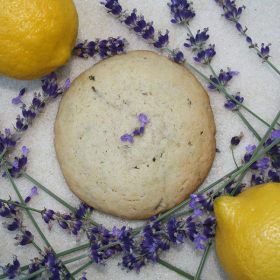 We take our snickerdoodle base and add fresh lavender from our favorite local lavender farm, Blue Heron Herbary. 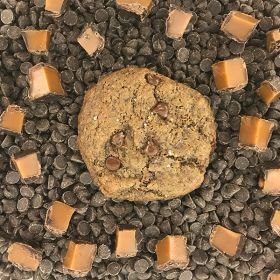 Made with Menegon's delicious Caramoka caramel sauce and cashews, this caramel coffee cookie is one you won't want to miss! The Kinglet Chai is a collaboration with Kinglet Tea which has been born from Dragonfly Chai. 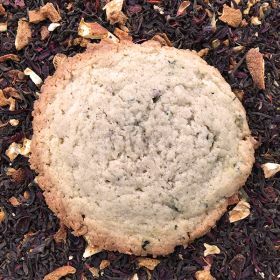 This sugar cookie features the full bodied spices from Kinglet's spicy chai. 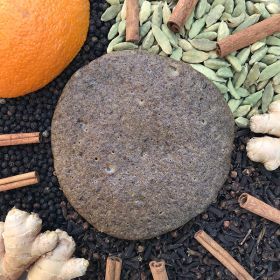 The flavor profile includes ginger, cinnamon, orange, cardamom, anise, and black pepper. 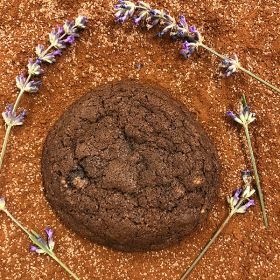 This chocolatey cookie is made with Momo Cocoa's Lavender Cocoa which gives it a nice floral hint! 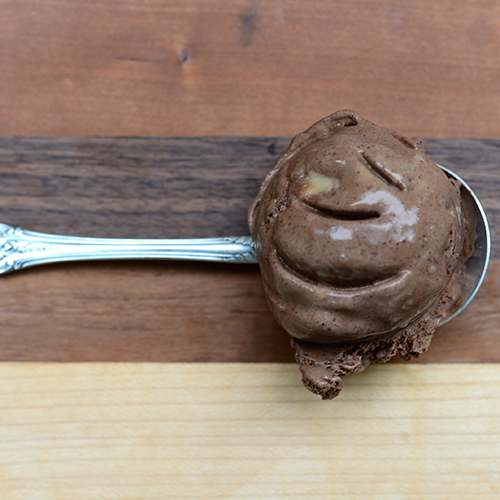 Made with dark chocolate chips, this is one of our personal favorites and is one of our best sellers. A vegan cranberry cookie rolled in sugar + spice. It's made with dried cranberries from Vincent Family Cranberries. 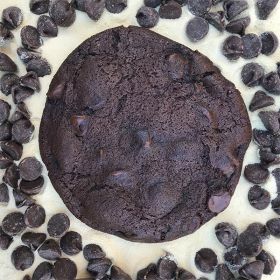 We teamed with Moonstruck Chocolate to bring you this double milk chocolate cookie! 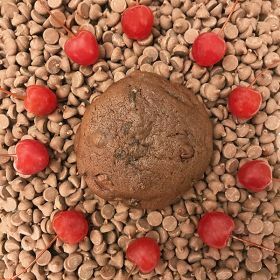 Amaretto liqueur and maraschino cherries are intimately involved with cocoa and chocolate chips in this amazing treat! 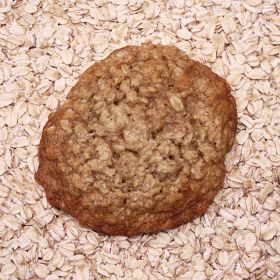 Made with Bob's Red Mill oats and generous helpings of butter and sugar our oatmeal cookie will blow you away. 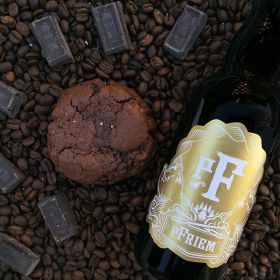 The Strong Dark is a muscular amalgamation of Strong Dark pFriem beer, Clutch coffee, and lots of chocolate. Imagine a sugar cookie and a cornbread muffin fell in love and had children... then you got to eat their delicious children! 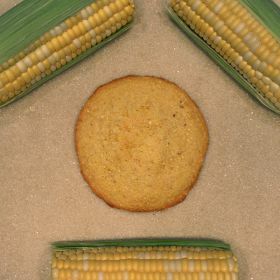 Say hello to Mama's Cornbread Cookie! 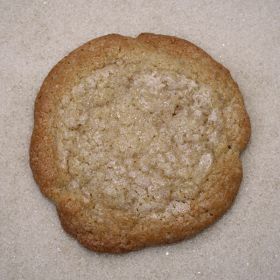 Our mouth-watering, gooey sugar cookie is made with 100% organic sugar. 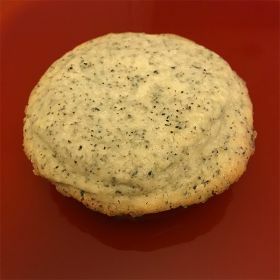 This shortbread cookie is infused with vanilla and earl grey tea. Each order comes with 2 smaller cookies. This cookie is made with milk chocolate chips and toffee bits. It makes for a sweet and caramelly delight! 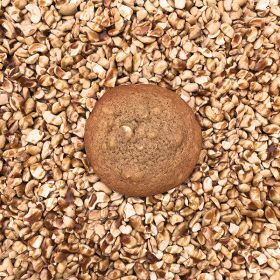 The brewer's yeast, flaxseed meal, fenugreek, and oats in this lactation cookie not only promote milk supply but also help combat fatigue. 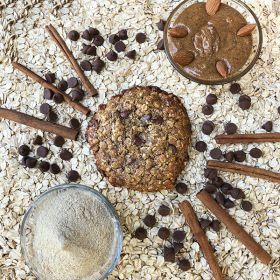 Made with milk chocolate chips, almond butter, cinnamon, and Chinese five spice, this cookie is both healthy and bursting with flavor! 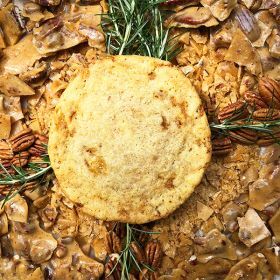 ​Made with rosemary pecan brittle from How Sweet It is, this sugar cookie has ​hints of rosemary and caramelized sugar. 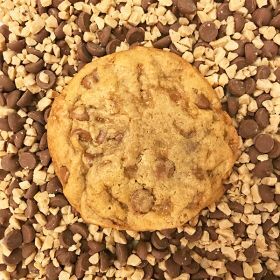 This amazing vegan chocolate chip cookie rivals our standard for flavor and gooey-ness. Don't forget we also deliver Cloud City Ice Cream Pints! 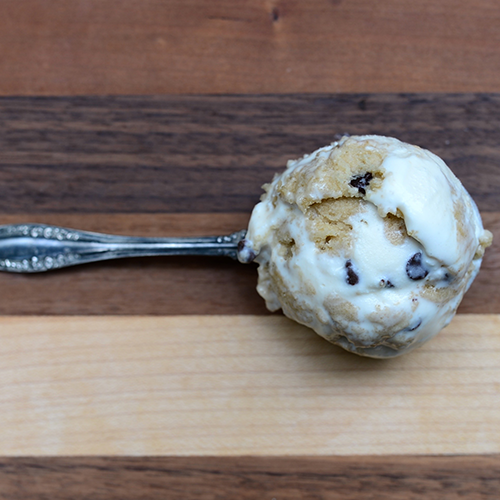 fresh cookie dough + local sea salt. When we visited Cloud City for the first time we were prompted to try the Sea Salt Cookie Dough ice cream and it immediately become one of our favorite flavors of ice cream in the whole world. 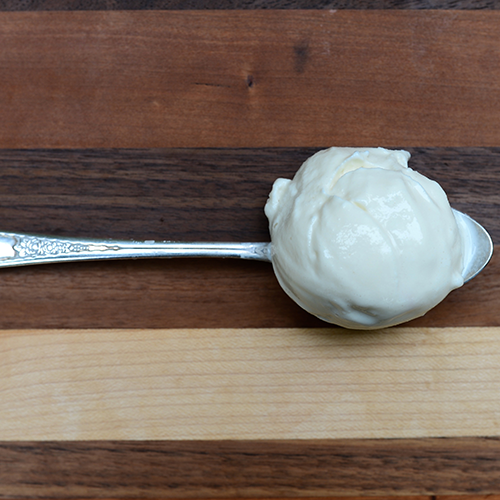 We should know, because we've literally tried ice cream of five continents. Feeling thirsty? We'll deliver 2% Milk, Chocolate Milk, and Clutch Coffee Coldbrew!